I’ve been pondering this hoop marking issue of mine since I last posted my SAL progress and it became an even bigger issue when I moved my hoop on top of mister sloth… I was not happy with the VERY smashed stitches! I notice with Lugana, stitches seem a little more fluffy then they do on Aida, which is why the hoop smashing was more evident to me. I looked at some scrolls on Amazon and looked at reviews for the QSnap. They all have their pros and cons, that I even attempted stitching in hand. 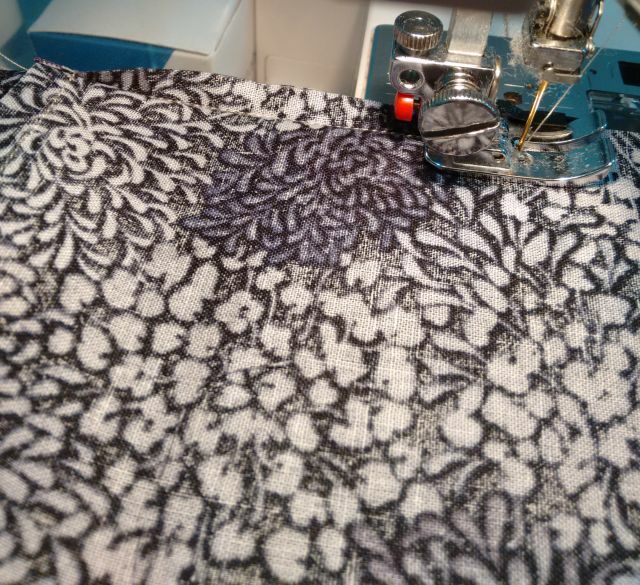 While I’m impressed that I’m capable of stitching in hand, I prefer the taught fabric to stitch on. Since I have no patience for shipping, I decided to look for a local needlework shop. The one in my city closed last year and it didn’t occur to me to look for the next closest one until now. I’m so happy I did too. 30 minutes away from me is a fantastic shop, that primarily focuses in Needlepoint, but has a decent size cross stitch section. The ladies were so very kind and helpful. They had some scrolls, but they were a bit heavy, so I decided on the QSnap 8″. I also perused their patterns, fabrics, and threads. I left the store quite happy, wouldn’t you say?! One of the reason I wanted the QSnap was for those cute little Grime Guards! What a fun way to use a fat quarter and to have a fun variety of covers. You could easily sew one up for every project, amiright?! First off, here’s the video tutorial that I watched to sew mine up by Tonya Stitches. Please note, that you are learning along with her and so I highly advise watching the full video first as she learns some things along the way. I didn’t do this, jumped right in, and discovered I needed to make adjustments after already starting. No big deal though, I’ll comment those fixes below for you to see. Mom gifted me this fat quarter a couple of years ago and it’s been waiting patiently in my stash for the perfect project. It reminds me of country cottage decor, which in my mind pairs nicely with the patterns I purchased. Not so much with my Into the Jungle SAL, so I think I’ll make another this weekend. 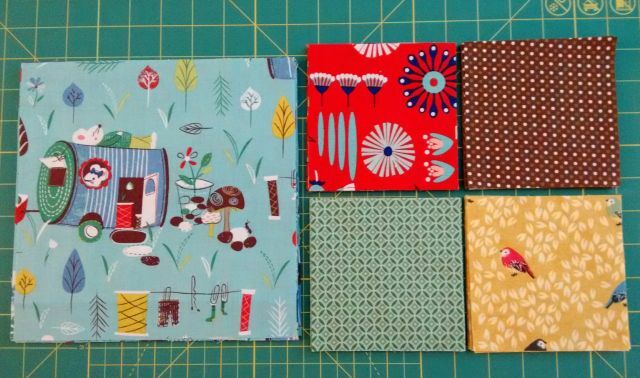 This Lynette Anderson Designs fabric features scrappy dogs and cats, along with garden elements. Materials: 1 FQ, elastic strap, and a sewing machine. 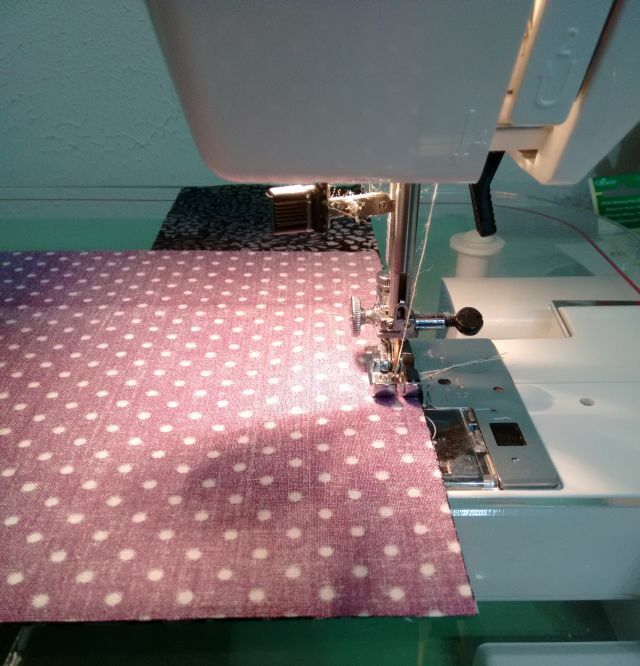 Step 1: Fold your fat quarter to cut as you normally would with yardage, trimming to square your fabric. Next, cut straight down the middle. You should have two 8.5″ wide strips. I decided to trim mine down to 36″. For an 8″ QSnap, you need at least 32″ + some wiggle room. 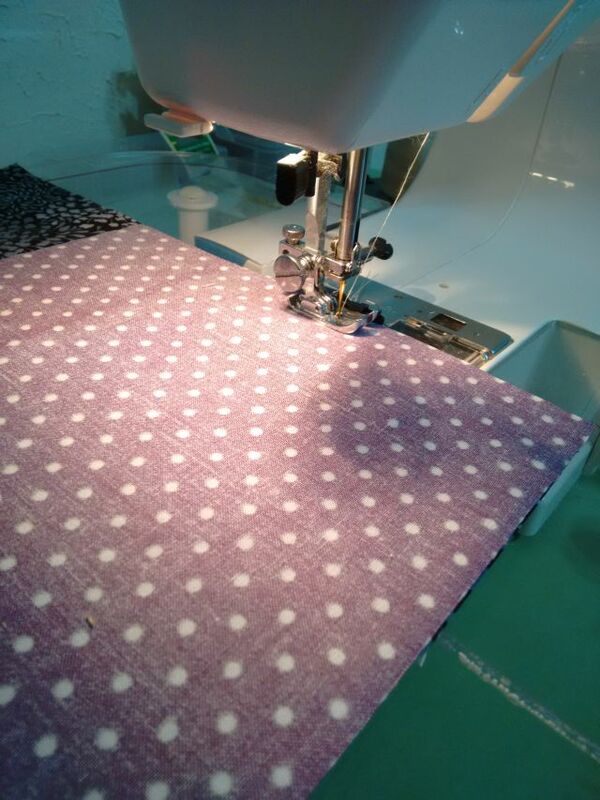 Step 3: Press a double 1″ hem along both sides. I used my nifty Clover Hot Hem ruler. (The video only presses a single 1″ hem, but she discovers that the grime guard is too wide this way at 7″. At this point, I just rolled the hem again and stitched down a second time, producing a double rolled hem. Your strip should now be 4.5-5″ wide, depending on your fat quarter size.) Personally, I like the finished 4.5″ wide grime guard. The 5″ was ok, just a tad to wide for my liking. Stitch close to the edge of the fold. Step 4: Cut 2 17″ elastic strips. (Perimeter divided by 2 + 1″ or 32/2=16 + 1= 17″). Use a safety pin to guide the elastic through the double rolled hem. You want to feed it in the direction of your pressed side seam. (In the video, she gets her safety pin stuck under her open seams). 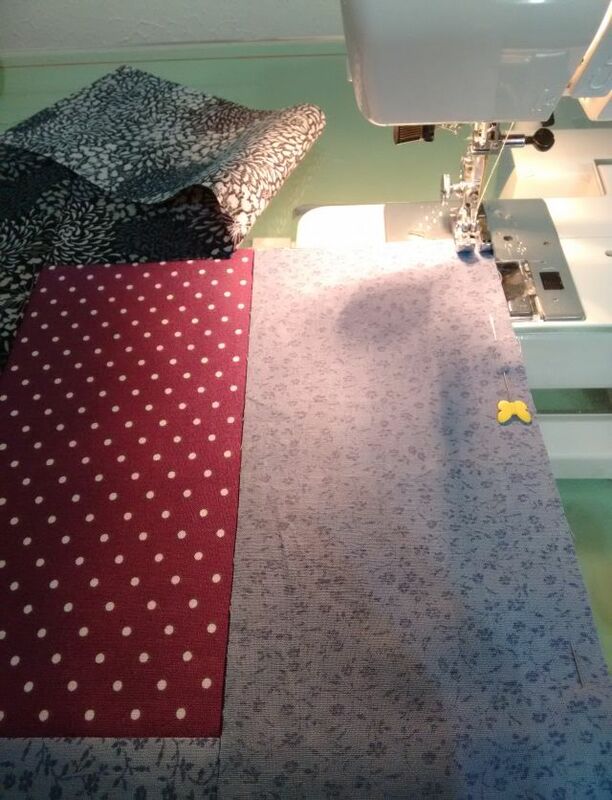 As the end of your elastic reaches the end of the fabric, machine tack it in place, then continue feeding the elastic through. Here’s where it begins to gather, then tack the other end in place to complete one side. Repeat on the other side. Step 5: With right sides together, sew the two raw edges together to create a loop. I decided to top stitch the raw edge of my seam allowance down. Your Grime Guard is now complete! …and test it out around your QSnap. There’s a little viewing of my February progress too 🙂 Colorful little toucan! I hope you found this tutorial helpful! There’s a few video tutorials out there, but all in all, a very quick and easy project. The Grime Guard helps to store your excess fabric and protects your work from your hands as you hold on to the frame. Now I’m ready to continue my stitching. I’ll be sure to let you know how the QSnap works for me. Until next time, happy stitching friends! Yesterday I made great progress on a baby quilt that I’m making for my husband’s cousin. She’s expecting a baby boy in November. Her shower is at the end of the month, so hoping I’m able to complete this quilt on time. So far, this quilt has been an easy and quick project; I’m enjoying it so far! While at the last quilt show, I found a perfect print, Mouse Camp by Erica Hite. 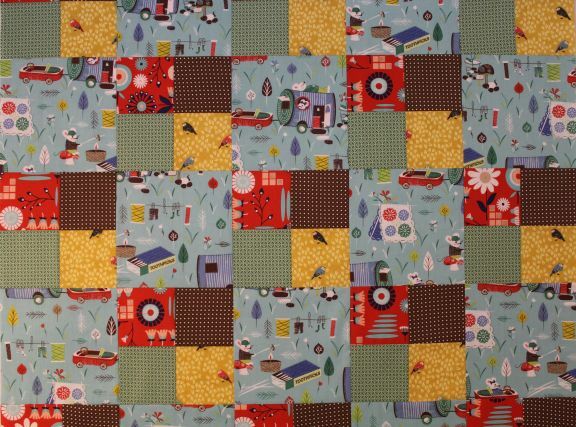 The family who’s receiving this quilt loves the outdoorsy/camping theme and this print had it all! 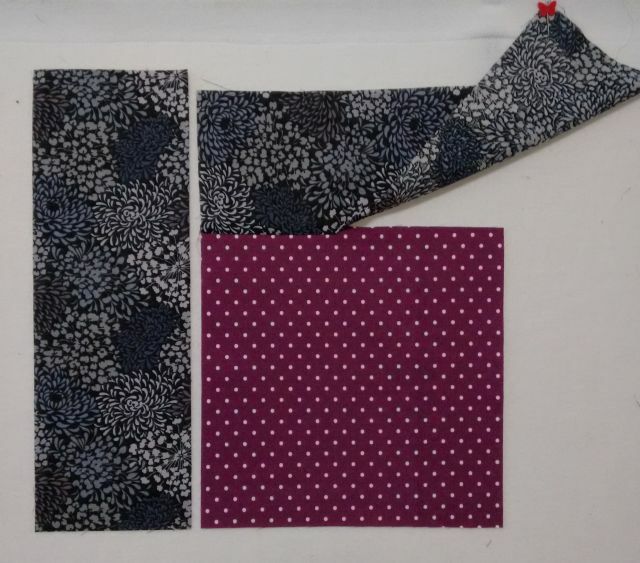 At the time I had no plan in mind, just a yard of fabric with an adorable print repeat. 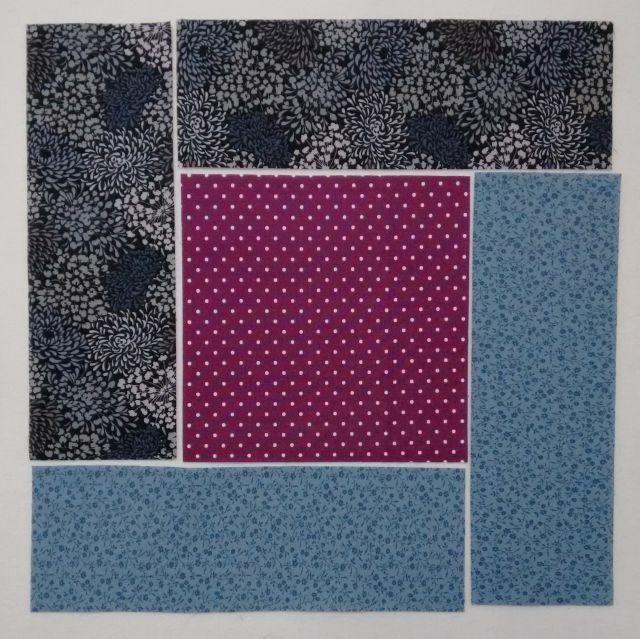 With that, I decided on a Double 4-Patch quilt pattern. 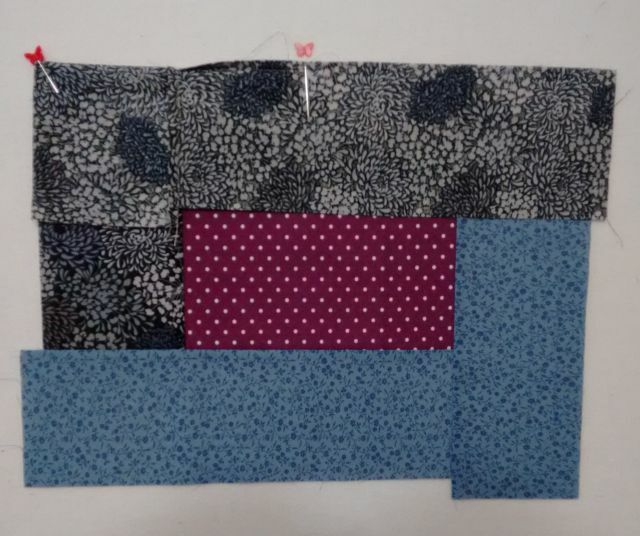 My plan was to utilize large squares to show off the mousy print and the 4-patch of solids, or smaller prints. 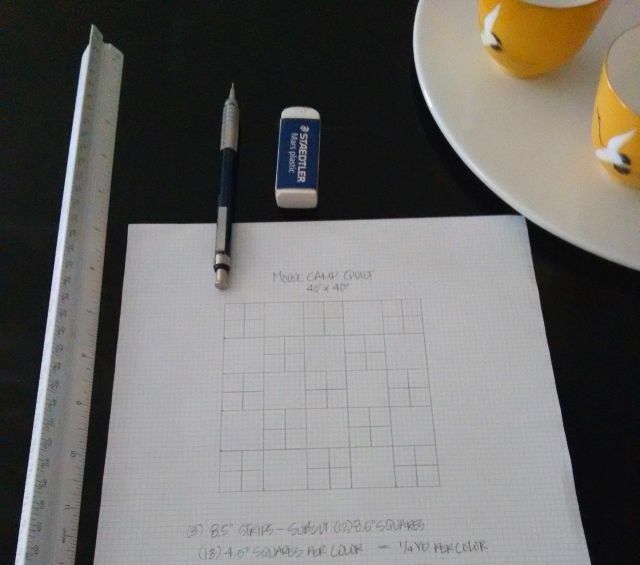 After some calculations and a goal of a 40″ x 40″ baby quilt, I took out some graph paper and put my plan down. 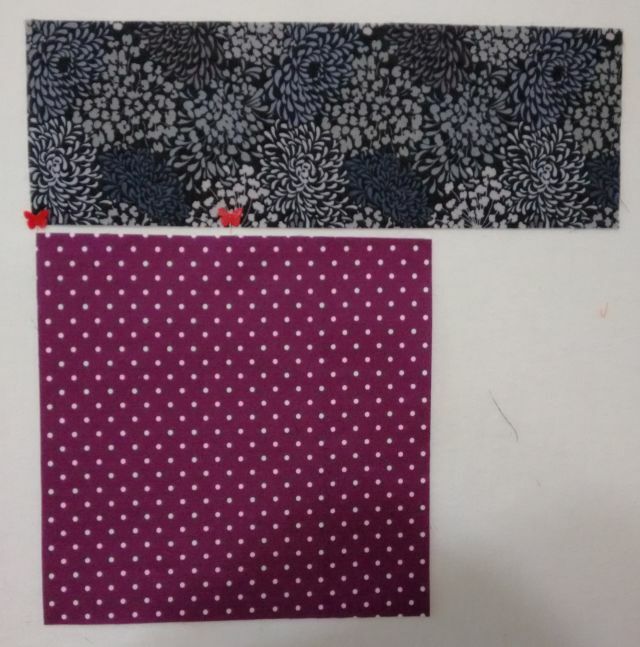 For this pattern, you will need 1 yard of fabric for the main print. (3/4 yd for a tight fit will work too). Cut (3) 8.5″ strips, then sub-cut into (12) 8.5″ Squares. 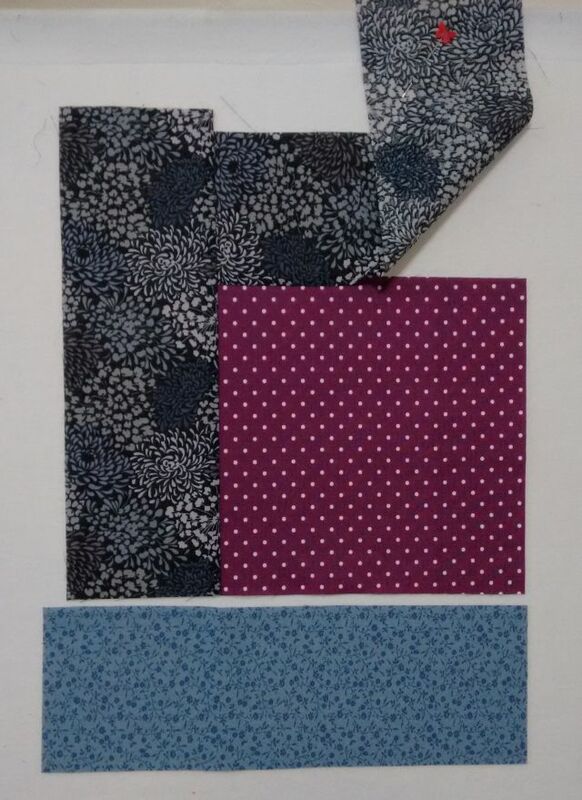 For the 4-Patch, you will need 4 solids or accent prints, 1/3 yd each. (1/4 yd for a tight fit…but I had some issues with this) Cut (2) 4.5″ strips from each color, then sub-cut into (13) 4.5″ squares. This equals a total of (52) 4.5″ squares. Keep your 4 color piles separate and organize them in the order you’d like if all 4-patches are to remain the same. I decided to keep all of my 4-patch blocks identical, but you can definitely have some fun with this! Alternatively, you can go with one main print and 2 accents like I did with my Traditional Block Thursday version: TBT – Double 4-Patch. My first step was to create all of the 4-Patch blocks. I chain pieced the top two colors first, then I chained pieced the bottom two colors. After pressing my seams in opposite directions, I pieced the top and bottom rows together. You will finish with 13 4-Patch blocks. I put them up on the design board, along with the 8.5″ squares, alternating the blocks until I was satisfied with my mouse placements 🙂 You will have 5 rows with 5 blocks each. 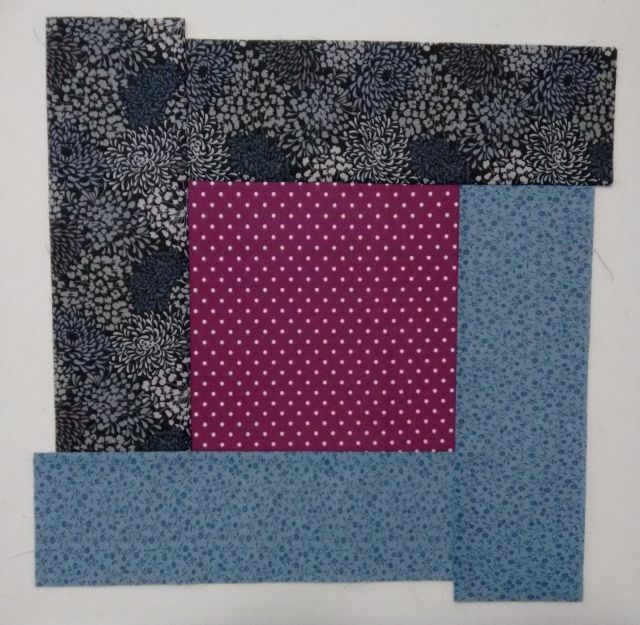 I completed the top by piecing the blocks together by rows, pressing my seams towards the 8.5″ mouse blocks, then sewing the rows together. 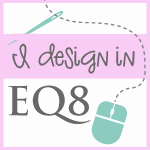 It’s up on my design board for now ready for the next step! This coming weekend, I will need to join some of my leftover batting with a zig-zag stitch. Have you tried this? It works great and minimizes wasted pieces! 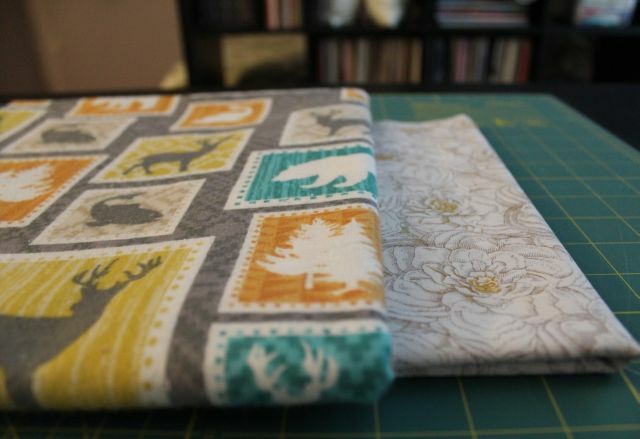 For the back, I selected a woodsy flannel fabric, which should be nice and cozy for baby. I purchased 1 1/4 yard for a whole cloth back and there should be some left over for my scrap baskets. The binding fabric is so lovely! Mainly white with a brown outlined flower print and golden-yellow centers, I purposely bought extra fabric on this so I could have some too! I like 2 1/4″ strips, if you do too, you’ll only need 1/3 yd of binding fabric. If you prefer 2 1/2″ strips, plan for 3/8 yd. From the binding fabric, cut 5 strips to accommodate this quilt size. I have plenty of variegated green thread from Superior Threads to quilt this blanket. 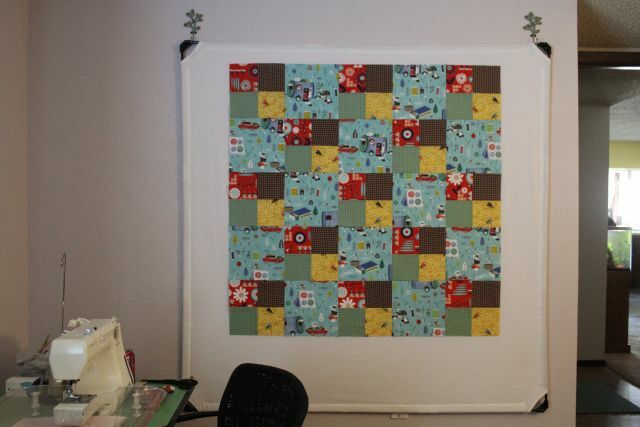 I’m thinking a simple straight-line quilting on either side of all seams to keep the quilt soft. Check back soon for the completed Mouse Camp Quilt! 2. I’m going to begin with my top rectangle and start the partial seam here. 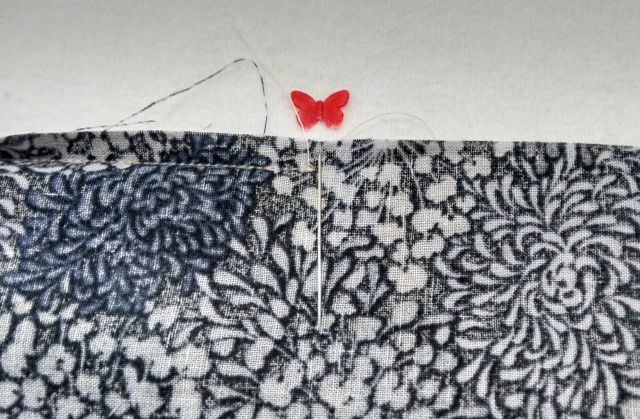 The red butterfly pins indicate where my stitch will be made. Beyer advises starting this stitch in the center of the middle square. Begin by locking your stitch and sewing off the end as you normally would. 3. 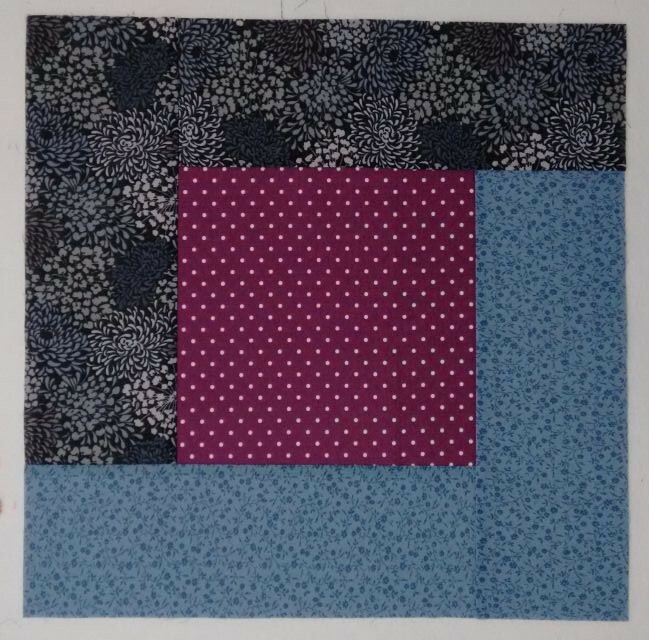 Here is the block now with the top rectangle and a partial seam. I went ahead and pressed this partial seam away from the center square (tutorials will suggest finger pressing) and laid out my next rectangle on the design board. I’ve pinned my hanging, un-sewn portion up for visual reference. My rectangles are a little longer so I ensure sewing with the tail on the outer edge. This way I can easily trim these off at the end. Now sew this next rectangle on as you would normally, right sides together, seam pressed away from the center square. 4. Now I have my top and left side rectangles in place. Next, I’ve laid out the bottom rectangle. With right sides together, sew this rectangle on next. Press seam away from center block. 5. Now we have top, left, and bottom rectangles in place. You’re ready to add the last rectangle! With right sides together, sew the right rectangle in place. Press seam away from the center block. 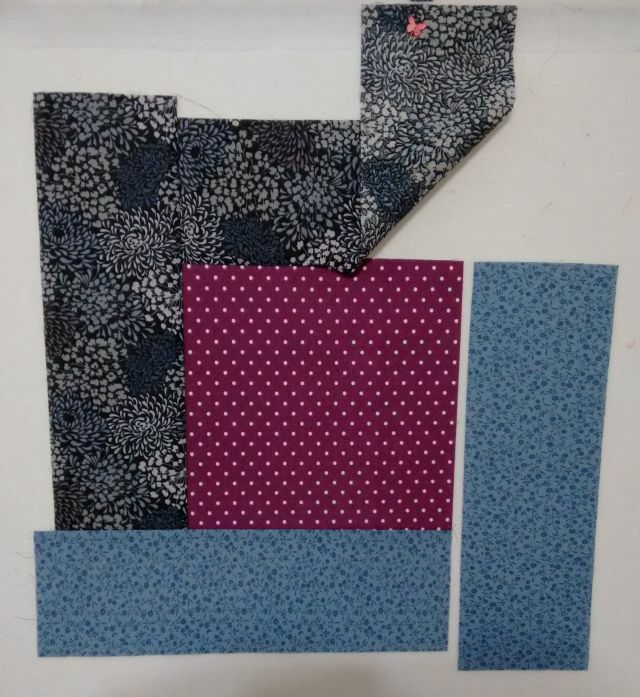 Be sure to move the top, un-sewn portion of the rectangle away as you sew the right seam. 6. Almost done! Now let’s complete the partial seam that was sewn in step 2. You will fold the top rectangle down so right sides are together. The butterfly pin above is to show you where my partial seam began in step 2 and where I will start again to complete this seam. Begin sewing by locking your stitch (just one back-stitch to avoid bulk where we’ve back-stitched previously) and sew off the end. Press the last seam away from center block. If your rectangles are long like mine, trim these ends to square up the block and you’ve completed a block using the Partial Seam technique! Now I can continue making the rest of my blocks. I’m really loving the color combination of Block 3. Looking forward to showing you the completed quilt top…stay tuned!